As pre-season clashes go, this one was pretty much a disaster for Doncaster Rovers. The rare sight of a sending-off in a friendly came alongside a poor performance which saw four goals conceded. Alfie May’s fully-justifiable 39th-minute dismissal turned the final warm-up game of pre-season turned into a farce. And goals from Kristian Dennis, Delail Brewster, Gozie Ugwu and Reece Mitchell saw Chesterfield twist the knife. May lost his head completely in the most disappointing and frustrating ten-minute act of petulism. It started when he did not get a decision from the officials after a tussle with Ian Evatt. It ended with a red card and the, frankly, embarrassment of having being sent off in a warm-up game. In between, he launched himself into a tackle from behind on Jordan Sinnott which would have likely seen him dismissed had the game been a competitive one. Referee Mark Heywood gave him a chance on that occasion but his patience had run out when the player fouled Bradley Barry and then appeared to stamp on the full-back. And so the remaining 50 minutes of the game were neutered of any competitiveness and rendered into a glorified training exercise. Scratching around for positives, it got more minutes into more legs ahead of the start of the season. It also allowed youth-team players to gain vital and useful experience of being part of the first-team environment. But, unfortunately, the negatives outweigh the positives and it hardly provided a nice lift of confidence ahead of the big kick-off. To lay blame for the disappointing performance squarely at May would be unjustified. 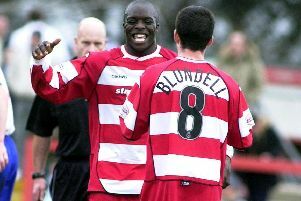 Arguably, the striker was the most lively - in the right way - Rovers player in the pitch during his 40- or-so-minute spell. The numbers game may have explained why Rovers spent the second half firmly on the back foot but there was little excuse for the lack-lustre first. Rovers were outworked, outthought and outfought by their hosts, who look set for a decent season in League Two. Chesterfield had more energy and more zip to their play while Rovers were ponderous. It saw them concede possession cheaply and consistently find themselves under pressure. Without being disrespectful, the majority of the 11 which started on Saturday are clearly part of the second string. Andy Butler, Niall Mason, Matty Blair and Joe Wright apart, the rest should have been looking to play their way into Darren Ferguson’s thoughts for the visit of Gillingham next Saturday. Perhaps more disappointing than anything else was the fact there were very few performances that were memorable or stood out. The presence of the likes of Butler and Mason also laid bare a worrying lack of depth in the Rovers squad. There are simply not enough options for two distinct 11s to feature across two friendlies. Injuries have certainly played their part in that but this game reflected the need for further additions during the current window. Some will look at the scoreline and suggest it shows the need for defensive reinforcement. Another centre -half would certainly raise confidence but, arguably, on this occasion it would have made little difference. Rovers were under pressure from the off but, pushed deep, the defence did well to keep Chesterfield at bay, restricting them to efforts from distance. The best of these came from the ever-impressive Chris O’Grady whose volley drew a superb one-handed stop from Marko Marosi. At the other end, and for the entire 90 minutes, Rovers had very few sights of goal and even fewer attempts. Once May shuffled off the pitch, it seemed inevitable that Chesterfield would score. And it finally came on 55 minutes. The ball fell kindly for Dennis in the middle of the box and he rattled the post with a shot before reacting quickest to turn in the rebound. Rovers held firm under increasing pressure for a while. But with 18 minutes to go, they conceded again. Full-back Dion Donohue cut through the Rovers defence with ease before squaring to substitute Brewster who slotted home from close range. The third and fourth came in the final ten minutes. First Ugwu received a pass in the area, turned and drilled a rising shot which went through the hands of young substitute keeper Louis Jones. Then Paul McGinn got in behind the Rovers defence and cut back to Mitchell who slammed in first time. It put the icing on the cake for Chesterfield and left Rovers to lick their wounds. Kick-off is fast approaching and there is work left to be done. Chesterfield: Anyon (Lee 61), O’Grady (Wakefield 71), Barry (Mitchell 61), Evatt (Maguire 88), Weir (Brewster 57), Ugwu, Hird, Sinnott (McGinn 70), Dennis (McCourt 57), Donohue, Reed. Subs not used: Dimaio. Rovers: Marosi (Jones 65), Mason (Garratt 46), Wright (Townrow 84), Butler (Fletcher 46), Alcock, Middleton, Blair (Walker 46), Ben Khemis (Fielding 66), McSheffrey, Williams (Scattergood 76), May. Referee: Mark Heywood (West Yorkshire).